And it won't be done until the clowns in Europe and USA who fancy themselves military strategists pack up their chessboards and go home. "ISIS’ growing presence in southern Syria has become a great concern for all parties involved in this battle; especially since their losses in northern Syria seem to be offset by their gains in the south." The Islamic State of Iraq and Al-Sham (ISIS) has once again advanced in the southwestern countryside of the Dara’a Governorate, capturing the village of Sheikh Saad after a violent two day long battle with Harakat Ahrar Al-Sham and the Free Syrian Army’s “Southern Front Brigades”. Sheikh Saad is situated to the west of Taseel; its capture by ISIS today has allowed them to build a buffer zone around the aforementioned town while also advancing east towards the provincial capital of the Dara’a Governorate. In addition to their advance at Sheikh Saad, the terrorist group launched another assault on the small village of Hayt, despite being repelled by Harakat Ahrar Al-Sham yesterday. ISIS’ growing presence in southern Syria has become a great concern for all parties involved in this battle; especially since their losses in northern Syria seem to be offset by their gains in the south. For the past two weeks, the small rebel-controlled town in Idlib province [Syria] has become the central battleground in a pitched power struggle between al Qaeda and the Free Syrian Army, a confederation of nationalist militias that draws support from Western governments. It all began when Nusra Front [Al Qaeda in Syria] fighters shut down a nationalist protest on March 11 – an act that escalated into full-blown clashes with Division 13, which al Qaeda eventually forced out of the town. While the military confrontation is over for now, Saoud’s supporters in Maarat al-Nu’man are harnessing their public support in defiance of the dominant Nusra Front. FSA supporters have organized escalating protests of the town’s men and women against al Qaeda, sparking such anger at the jihadist group’s abuses that Nusra was forced to withdraw, at least temporarily. A religious court is deciding when and if either side can return. The fight is less about territory and military strength, where the Nusra Front still has a clear upper hand, than it is about legitimacy, popularity, and propaganda. The FSA is gambling that it can leverage the popular backlash against the Nusra Front that followed the clash in Maarat al-Nu’man to argue that a popular nationalist revolution survives. For supporters of Syria’s original non-violent nationalist uprising, the entire project of fixing Syria is at stake. If the ragged coalition of activists and nationalist rebels who cooperate under the brand of the Free Syrian Army collapses, they say, Syria will be left with a bitter choice between two murderous and sectarian alternatives: Bashar al-Assad’s regime or Islamic fundamentalists. On Mar.29, the Syrian Democratic Forces [SDF], mostly Kurdish YPG units reportedly launched an offensive towards the town of Manbij in Northern Syria. Meanwhile, Kurdish units captured the Al-Shat checkpoint and the Al-Kadi Villa near Azaz and attempted to advance to the town, which remains one of the latest Al-Nusra-controlled logistical hubs used to receive supplies from Turkey. In turn, Al Nusra militants supported by the Free Syrian Army (FSA) launched a counter-offensive in the area. Pro-militant sources report heavy casualties among the SDF. It’s confirmed that a Kurdish T72 battle tank has been destroyed with a TOW-missile. Now, heavy clashes are ongoing at the contested area near the town. It’s also expected that al-Nusra and the FSA militants will be able to concentrate a majority of their forces at the Azaz front because there is no threat of ISIS advance in the area. Turkish, Qatari, and Saudi-backed groups have a kind of agreement dividing spheres of influence in Northern Syria. Are Islamic State and other Salafist forces about to collapse in Syria? All of this is rapidly weakening IS and the other rebel forces and a general collapse is coming, even in Iraq. Armies lose heart when defeated repeatedly. IMO there are many [IS] who wish to leave, get a transfer to Libya, or whatever. OTOH what I call the R+6 [Syrian Army coalition including Russia] now has the habit of victory. The available evidence suggests [Qaeda front] Al Nusrah is widely respected on the ground [in Syria] five years into the rebellion. There are pockets of resistance, but the West has no real strategy for harnessing this discontent and diminishing al Qaeda’s influence in the rebellion. Perhaps that is not even currently possible. Still, the events of the past two weeks highlight a liability al Qaeda has long sought to minimize in Syria. Protesters took to the streets in some areas to denounce Al Nusrah. It does not appear that the protests were widespread, but they were noteworthy. ... the Syrian Al-Qaeda group “Jabhat Al-Nusra” reportedly assassinated a prominent field commander of Jaysh Al-Islam (Army of Islam) inside the town of Zamalka. The field commander was identified by rebel social media activists as Sheikh Abu Suleiman Taffur – no reason was provided for his assassination by Jabhat Al-Nusra. I'd say the reason is that al Qaeda has long evinced a pattern of knocking out competition that won't play by its rules. Against this is the very energetic secret police in Syria and the fact that many if not most Syrians who endured the war years are sick of the alphabet soup of Salafist jihadi organizations. 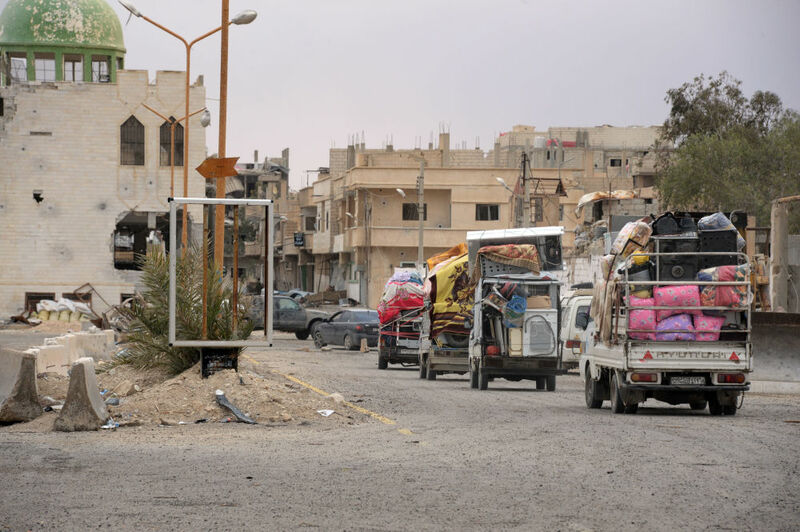 Islamic State found Raqqa easy pickings because many residents wanted to live under an Islamist government; they considered it to be a big step up from Assad's administration. Having now lived under Islamic State they've changed their minds. There are Sunni Muslims in Syria who're still looking for the unicorn -- a 'nice' Sunni Islamist government -- but I think Syrian soldiers, none of whom will be fans of Islamist government when they become veterans, will be calling the political shots once the fighting dies down. This is provided Assad can scare up enough civilian jobs and ram through the constitutional reforms he's been trying for years to get past the Baath Party. And provided foreign governments instigating in Syria cease and desist. That's a big "if." No, Mr Schiff, it's part of the three-dimensional chess game in your head. The horror is that the mind game has been inflicted on millions of innocents. And the "fairly new phenomenon" has been going on ever since fiends began dumping mountains of weapons into Syria. Well this is a first. THANK YOU AL-MASDAR NEWS FOR SUPPYING A TIME ALONG WITH THE 'BREAKING NEWS' HEADLINE. For months now it's been breaking news stories from AMN with no time given. But with the time supplied, the breaking news is about four hours old. So it's about 8 AM in Damascus right now, which is 7 hours ahead of Eastern Daylight Time in the USA. No word yet on how successful the assault has been. At 4:15 A.M. (Damascus time) on Wednesday morning, the Syrian Arab Army’s 67th, 81st, and 120th brigades -backed by the Syrian Social Nationalist Party (SSNP), Qalamoun Shield, and Desert Hawks – launched a joint assault that targeted the Islamic State of Iraq and Al-Sham’s (ISIS) defenses near the Quraytayn Orchards. According to a battlefield correspondent, the Syrian Armed Forces launched the assault under the cover of darkness in order to evade ISIS’ machine gun nests that were forestalling their advance at Quraytayn’s southeastern flank. Should the Syrian Arab Army and their allies enter the Quraytayn Orchards, they will have established an important foothold on the fringes of the city, leaving the ISIS terrorists surrounded from three different flanks. Assisting the Syrian Armed Forces from above is the Russian Air Force, which is currently targeting ISIS’ positions around Quraytayn and the vast Syrian Desert, destroying any presence of the aforementioned terrorist group in their sight. In the coming hours the battle will likely intensify as the Syrian Arab Army and their allies attempt to enter Quraytayn after a seven month absence from the city. Footage of Palmyra broadcast on Russian television showed Syrian troops trying to unearth bombs buried below a road and one apparent explosive system made of rigged-up petrol containers. Efforts to assess the archaeological damage to the 4,000-year-old city have been slowed by the traps and sporadic fighting with ISIL fighters nearby. He revealed that the regime had worked in secret with “45 to 50 people” inside the city to persuade ISIL against completely razing ancient areas of the city during its 10-month reign. “(ISIL) saw that there would be a popular uprising against it if it destroyed everything. It didn’t steal and it didn’t destroy everything,” he said. The famed Lion of Al-Lat, shattered by ISIL last year, could be put back together and there was not the widespread looting that had been feared, he said. Amr al-Azm, a former antiquities official who is a now a member of the opposition, said that while the deliberate destruction of artifacts caused by ISIL had been “catastrophic” there was less damage during the regime offensive than feared. There was still considerable looting and destruction but nothing next to what some treasures in Iraq suffered. See ‘The stone walls have been literally pulverized’: ISIL razes 1,400-year-old Christian monastery, the oldest in Iraq (Associated Press, January 2016). And as the reports on Palmyra mention, "some of the simpler structures, such as the 1,800-year-old Roman Arch of Triumph, could be restored relatively quickly," although others will take longer. After the sappers managed to clear mines at the entrance and in some parts of the city, the military unblocked the road and allowed journalists to start working in Palmyra and its national museum. The militants broke all pedestals and display cases and scattered pieces of statues across the floors. As a result of hostilities, the museum's roof was broken and a wall was severely damaged. However, the report was filed by a few journalists who were quickly eyeballing the damage to the museum; probably archaeologists will find much in the museum that can be restored once they make a close inspection. And a little-known fact, publicized by Sputnik only when the Syrian Arab Army offensive to retake Palmyra was well underway (March 25), is that prior to retreating from Palmyra last year, the SAA evacuated not only the majority of civilian residents but also the most precious antiquities in the museum. And there is surely a worldwide dragnet to locate catalogued artifacts that were stolen by IS and sold on the clandestine antiquities markets. I wouldn't be surprised to learn that a good number of the stolen artifacts were purchased by representatives of museums around the world that were determined to save the Palmyra antiquities and hold them until Islamic State was routed. I'd assume the effort was redoubled after IS murdered Khaled al-Asaad, a Syrian archaeologist who'd hidden several Palmyra artifacts and refused to divulge their location even under threat of death. After that, I think saving Palmyra's antiquities became very personal for museum boards of directors and legal private art and antiquities collectors all over the world. There is another positive aspect about the restoration of Palmyra: it represents a special case. This will unlock donations that otherwise wouldn't have been available to the restoration. The issue with rebuilding destroyed ancient ruins is that once this is done the ruins are no longer "genuine" no matter how artful the restoration. Yes I know it can sound a bit silly on first hearing but organizations dedicated to funding the preservation of ancient sites have to think this way. However, an exception will be made for Palmyra. And while the report I quote below doesn't mention this, I suspect one reason for the exception is the heroic sacrifice of Khaled al-Asaad, who'd dedicated his adult life to preserving Palmyra. Damascus, SANA – Primary ideas for a rehabilitation plan to restore glory of Palmyra have been set up after the archaeological city was cleared of terrorists by the Army, the Director General of Antiquities and Museums Directorate (DGAM) said on Sunday. “Reconstructing some vandalized ruins is possible in spite of “the ultimate losses that are archaeologically irredeemable in terms of genuineness,” DGAM Director General Maamoun Abdul-Karim added. Experts will estimate the volume of damage on a field visit in the upcoming days for making emergency works and setting up strategies for rehabilitating monuments such as Palmyra Castle and re-building the temples of Baalshamin and Bel, the Arch of Triumph and the funerary towers, which were demolished by ISIS terrorists last year. “The general and known viewpoint prefers not to rebuild antiquities but in the case of Palmyra it is different …We seek to restore the devastated temples in a way that preserves their historical identity depending on the original stones remaining in the site or bringing new identical ones from the city’s quarry,” Abdul-Karim said. “A unique symbolism is now added to the world-famous historical city after having defied terrorism,” DGAM Director-General said in reference to Palmyra’s newly acquired terror-challenging symbol, clarifying that rehabilitating works will be carried out with the aim of having these antiquities witnesses to the terror atrocities. DGAM has a qualified staff of construction engineers and archaeologists of high scientific competence and good experience in the archaeological restoration and the rehabilitation of archaeological buildings after events such as war and [other] catastrophes. DGAM will carry out works of rehabilitation and restoration in cooperation with local and international partners from the United Nations Organization for Education, Science and Culture (UNESCO), the International Council on Monuments and Sites (ICOMOS) and International Centre for the Study of the Preservation and Restoration of Cultural Property (ICCROM). On 19 of April, a monument of Palmyra Arch of Triumph will be put in London Square. The six-meter high monument weighing 12 tons has been designed by the Institute of Digital Archaeology at Oxford University in coordination with the DGAM, and it is to tour several world cities including New York before it is finally placed in Syria. Abdel-Karim pointed out that the DGAM rehabilitated numerous archaeological sites after the Syrian Arab Army restored security and stability to the areas containing them, such as Krak des Chevaliers, not to mention restoration work implemented in Ma’aloula and the Old City in Homs. Given the size and complexity of the restoration task and that cutting-edge technologies are now available to such projects, I think experts from several disciplines will volunteer their time to assisting the Syrian restoration team. There are debates about how long the restoration will take. See this March 28 report from The Wall Street Journal, Syria’s Palmyra Can Be Repaired in "Five Years" . While the report makes clear that five years is a very hopeful estimate, there will be much progress in that time. But no progress would have been possible without the incredibly shrewd argument President Bashar al-Assad's administration put forward to Islamic State. Dozens of citizens of Palmyra were overwhelmed with emotions as they expressed their thoughts on the liberation of their city, according to Sputnik's Arabic edition. In an interview with Sputnik's Arabic edition, citizens of Palmyra pointed the finger at Daesh terrorists for killing civilians and thanked Russia for adding to the liberation of their ancient city. 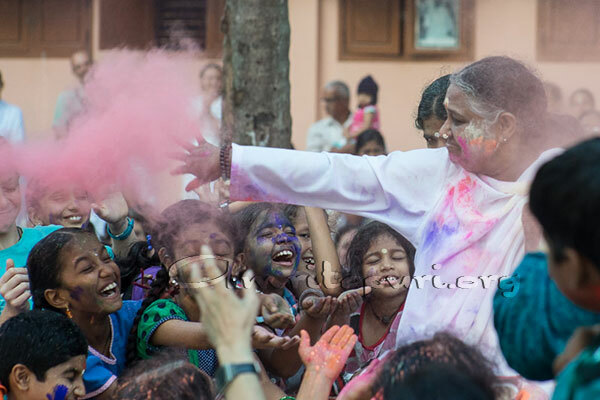 For readers who saw the Joy 2 post before I updated it, Charles Cameron sent photographic proof that an Indian Hindu spiritual teacher today known as Prem Rawat celebrated Holi in the USA with his followers around 1973, and that this included his use of the traditional Holi colored water and powders. From the extensive Wikipedia article about Rawat it's not clear to me whether he ever conducted Holi celebrations while he was in India. He eventually became a U.S. citizen, distanced himself from all things Hindu, and converted his organization from a religious to a purely secular one. Nevertheless when I wrote, "It's just not done, it's never been done, for an Indian spiritual teacher of [Amma's] level -- or any level for that matter -- to join in the Holi merriment to that extent," I should have qualified the statement by adding "to the best of my knowledge." Born 1943 in Portsmouth, England, Scottish in name and heart, Charles Cameron is a vagabond monk traversing religious traditions. He was nine when his father, a naval officer who’d fought in the Battle of the Barents Sea, died, and shortly thereafter decided that religion might offer a more reliable version of ‘family’ than biology had, and applied to an Anglican / Episcopalian monastery in Yorkshire to join the community. Unsurprisingly, they weren’t quite ready for an eleven-year old monk, but his application landed on the desk of the remarkable Fr. Trevor Huddleston, CR, recently returned from South Africa, who took young Charles under his wing, mentored him in monastic values – and introduced him to the poetry of Gerard Manley Hopkins. Charles went up to Oxford with a love of the arts and liturgy and read theology under Reverend AE Harvey at Christ Church. While at Oxford, Charles met the young Tibetan lama, Trungpa Rimpoche and widened his interests to include the monastic and contemplative traditions of the East. Many years later it seems Charles brought it all home. He turned to his father's defense-oriented outlook by adding his spiritual insights and knowledge of theological matters to Mark Safranski's Zenpundit website, which is chiefly concerned with American defense issues. I'm now going to take another flyer but this time with the safety net of the qualifying phrase "to the best of my knowledge." To the best of my knowledge bhajan singing, as it's traditionally done, is a pretty staid affair; no dancing, no hopping up and down or otherwise acting as if one is at a Pentecostal revival meeting. But at least one time, which was recorded on video, Amma sat amongst an audience of her devotees instead of onstage for the bhajan singing, and allowed the audience to let rip with a bhajan called Mata Rani Ne. I don't know whether she wrote the song but it seems to be greatly associated with her. The video shows a bunch of guys got up something like Cossacks with fake beards who are jumping around. (I'll bet they were American.) And there's a group of Indian and Western ladies doing sort of a line dance. At one point toward the end Amma humorously claps her face with her hands as if to say, 'What have I done?' But it was all to make an important point. The bhajan is a song of thanks to God (in the female aspect of the Divine Mother) just for putting in an appearance at one's house. From the English translation of the lyrics provided by Maala Nair for another version of the same bhajan at YouTube. To ask for nothing of the divine but the sight or clear sign of its presence is not easy for human nature, which tends toward the transactional. Thus, we have God treated as Santa Claus (Here's my list), as Boss Tweed (How much will you pay me to believe in you?) or a black magician (Smite my enemies for me). Yet those who ask only for a personal experience of God, as Amma exemplifies in her teaching mission, gain everything without asking. Many people aren't ready to gain everything and that's okay. But even remembering on occasion to be grateful for the thought of the divine is enough to deepen one's capacity for gratitude, which is reciprocated many times over. What does Saharan Tuareg band Tinariwen have in common with Gene Autry? Tinariwen was founded by Ibrahim Ag Alhabib, who at age four witnessed the execution of his father (a Tuareg rebel) during a 1963 uprising in Mali. As a child he saw a western film in which a cowboy played a guitar. Ag Alhabib built his own guitar out of a tin can, a stick and bicycle brake wire. He started to play old Tuareg and modern Arabic pop tunes. Ag Alhabib first lived in Algeria in refugee camps near Bordj Badji Mokhtar and in the deserts around the southern city of Tamanrasset, where he received a guitar from a local Arab man. Later, he resided with other Tuareg exiles in Libya and Algeria. In the late 1970s, Ag Alhabib joined with other musicians in the Tuareg rebel community, exploring the radical chaabi protest music of Moroccan groups like Nass El Ghiwane and Jil Jilala; Algerian pop rai; and western rock and pop artists like Elvis Presley, Led Zeppelin, Carlos Santana, Dire Straits, Jimi Hendrix, Boney M, and Bob Marley. Ag Alhabib formed a group with Alhassane Ag Touhami and brothers Inteyeden Ag Ablil and Liya Ag Ablil in Tamanrasset, Algeria to play at parties and weddings. English version : A beautiful musical documentary on the leading group of Tuareg music: Tinariwen. This is the rock of the Tuareg- BB King encounter between A Sharp and muezzins overexcited, rebellion songs of wandering, love, nomadic blues popularized outside the borders of Mali by the group Tinariwen; literally the new Tuareg Culture . Of course it could have been a Roy Rogers film he saw. Thank you, Al-Masdar News (AMN), thank you, thank you. This 2:18 minute video tour, filmed today, really needs to be viewed in full screen at YouTube. Islamic State did a lot of damage to the monuments but several will be pieced back together or rebuilt from stones mined from the same quarry that provided the original stonework, thousands of years ago. This rebuilding project, when completed, will be one of the wonders of the world. And the project even at this early stage of planning is already global in its sweep. So the triumphal music accompanying the footage is warranted. Evil lost this round. Syrian government forces have retaken the city of Palmyra from Islamic State, a military source told RT. "After heavy fighting during the night, the army is in full control of Palmyra – both the ancient site and the residential neighborhoods," an army source told AFP. IS fighters have reportedly retreated from Palmyra to the towns of Sukhnah, Raqqa, and Deir Ezzor. It was previously reported that Syrian Army forces had advanced into the city on Saturday, with support from Russian airstrikes. Television footage showed explosions taking place inside Palmyra, with smoke rising from buildings. Tanks and armored vehicles fired from the outskirts of the city. It comes after Russian warplanes carried out 158 airstrikes, hitting terrorist targets in and around the city, according to the Russian Defense Ministry. More than 100 extremists were killed in the bombardment, and several pieces of heavy equipment destroyed. The recapture of Palmyra marks the biggest reversal for Islamic State (IS, formerly ISIS/ISIL) since Russia's intervention into Syria. The ancient city, seized by IS in May 2015, is a UNESCO World Heritage Site. It is home to dozens of remarkable monuments of antiquity, and a number of historical sites that have been destroyed by IS jihadists since they captured the city, among which were the 2,000-year-old Temple of Bel and the Arch of Triumph. On Saturday, the Syrian government’s head of antiquities, Mamoun Abdelkarim, said the authorities would try to restore the historic sites. "We will rebuild them with the stones that remain, and with the remaining columns,"Abdelkarim told Reuters, adding that his team would "bring life back to Palmyra." 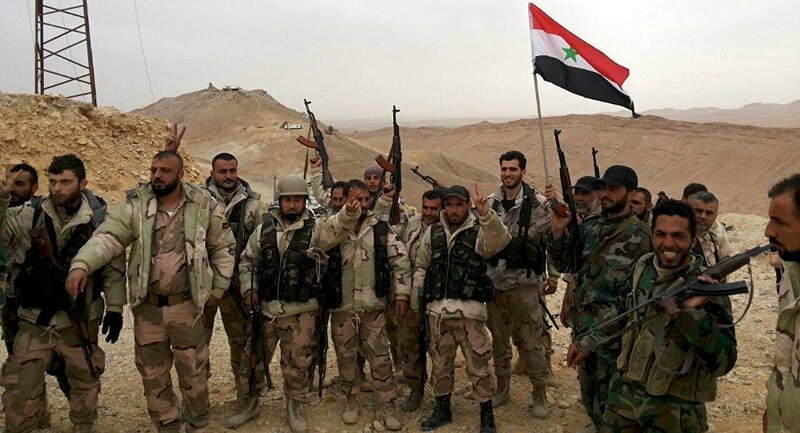 The Syrian Armed Forces and National Defense Forces, backed by the Russian Air Force, have triumphantly recaptured the ancient city of Palmyra in the heart of the Syrian Desert. The Syrian Armed Forces began their widescale offensive on March 8th, striking the surrounding hills and orchards before they eventually stormed the ISIS-held bastion. The number of ISIS militants killed in the 18-day long battle has not been confirmed by the Syrian Arab Army; however, a third-party source who has been accompanying the Desert Hawks during the battle has confirmed to Al-Masdar News that hundreds of jihadis have been killed, along with a large number of vehicles and heavy weapons destroyed. Homs, SANA- A military source said that army established full control over Palmyra city in the eastern countryside of Homs province. The source added that units of the Army and Armed Forces, in cooperation with the popular defense groups, on Sunday eliminated the last gatherings of ISIS terrorists in the city and destroyed their last hideouts. The army’s engineering units combed the city completely and dismantled the bombs and explosive devices planted by ISIS terrorists. Joy 2: Happy Holi! Happy Purim! Happy Easter! I would've included mention of Holi in today's Joy post but the Indian (and Nepali) holiday, like Diwali, starts on different days in different parts of India; I thought it was already over. It turns out that today, March 24, is the official date for the holiday this year -- although another source says "Holi in 2016 will start on Wednesday, the 23rd of March and will continue for 2 days until Thursday, the 24th of March." So we have Purim, the joyful holiday of deliverance from evil celebrated by the Jewish people, and Holi falling on the same day -- and on Sunday we have Easter! The Sign doesn't get more auspicious than that. The importance of the Sindh resolution can't be underestimated. The news is on par with the Egyptian government's recent historic decision to include in Egyptian public school books mention of the peace declared, decades ago, between Egypt and Israel. Holi is a Spring festival and, as with Diwali -- the Fall harvest version of the holiday -- celebrates the triumph of good over evil. But Holi is a riotous occasion with everyone taking to the streets to good-naturedly squirt colored water from big water guns and pelt each other with bright-colored powders. This is one holiday when you don't want to dress up in your finest. There's also lots of song and dance and exchanging of sweets. The holiday, as this March 24 RT report highlights, has gone global with many non-Indians around the world joining in the fun -- a trend that's been building for years. Even a Google Doodle got in the act this year, I learned from RT. There is another historic aspect to Holi celebrations, and that is the participation of India's Mātā Amṛtānandamayī Devī, "better known simply as Amma, a Hindu spiritual leader and guru who is revered as a saint by her followers," according to Wikipedia. The first time I saw a photograph of Amma's face and robe smeared with Holi powders, which was last year, I might have keeled over in shock if I hadn't been sitting down. It's just not done, it's never been done, for an Indian spiritual teacher of her level -- or any level for that matter -- to join in the Holi merriment to that extent. Even Sathya Sai Baba, the 'Guru to The Masses,' would not have allowed himself to be smeared with colored powders -- and he would never have flung the powders at people. From photographs Amma has been doing both for some years. She's been doing a great many other things that have never been done before, such as kissing babies, hugging people and letting people hug her. It is unheard of. One is allowed to touch the guru's feet -- the feet being the symbol of the divine's involvement in the realm of ordinary appearances -- but not hug him, or her. The kicker about Amma is her 'previous' incarnation. Although she's never (to my knowledge) publicly verified this, the story is that a very great Yogi, whose name escapes me at the moment, was walking along a street one day and suddenly he burst into laughter. When asked what he found funny, he replied that he'd be incarnating next as a female, and named the village where she would be born -- the same village in which Amma was born. Probably people thought he was talking in riddles. But, yes. What sits behind the cuddly, Holi powder-throwing baby kisser is a gen-u-ine Yogi. Just published: Joy 2: Happy Holi! Happy Purim! Happy Easter!, an essay chiefly about Holi that mentions good and very surprising news out of Pakistan related to the holiday. And what do we, in the region, do with this startling new information about how wars are conducted against us -- using our own populations as foot soldiers for foreign agendas? "Shut up your mouse, Obama"
On the first day of this blog in 2004 I warned it was imperative that Washington retire its Cold War playbook because tactics that had been successful in earlier eras were now easily seen through. My warning, and advice I gave for how U.S. foreign policy should be conducted going forward, were ignored. The most powerful factions in Washington's foreign policy establishment doubled down on their shopworn tactics. Looking back, it couldn't have been any other way. My simple advice -- play it straight -- was aimed at people who'd told so many lies for so long they didn't know how to play it straight. 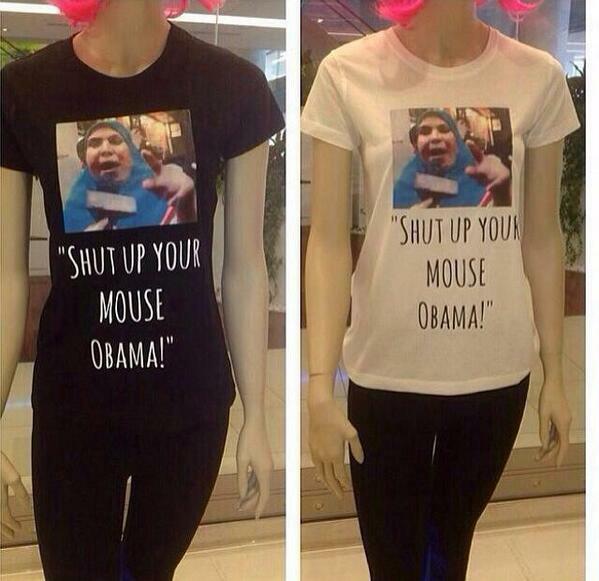 Fast forward to March 2014 and impromptu criticism of the President of the United States of America from a middle-aged Egyptian housewife, delivered in hilarious botched English; within hours her diatribe had been T-shirted in Cairo. And just like that, a spell was broken. The American government was still powerful and extremely destructive, but now it was seen for what it actually was: a juggernaut steered by fools. Fast forward to Sharmine Narwani's shattering deconstruction, in splendid English, published yesterday. The awful irony is that the strategy she describes for incitement was taught by Americans to Muslims who turned out to be Salafist jihadis, who then used the strategy to radicalize Muslims living in Westernized countries and turn them against the West -- America in particular. We know now that several thousand Syrian security forces were killed in the first year, beginning March 23, 2011. We therefore also know that the opposition was “armed” from the start of the conflict. We have visual evidence of gunmen entering Syria across the Lebanese border in April and May 2011. We know from the testimonies of impartial observers that gunmen were targeting civilians in acts of terrorism and that “protests” were not all “peaceful”. This is followed by a list of “vulnerabilities” – political, economic, ethnic, sectarian, military, psychological – and recommended “actions” on how to “exploit” them. The next level of operations would be to establish “national front organizations [i.e. the Syrian National Council] and liberation movements [i.e. the Free Syrian Army]” that would move larger segments of the population toward accepting “increased political violence and sabotage” – and encourage the mentoring of “individuals or groups that conduct acts of sabotage in urban centers. And what do we, in the region, do with this startling new information about how wars are conducted against us - using our own populations as foot soldiers for foreign agendas? The first lesson learned is that ideas and objectives can be crafted, framed finessed and employed to great efficacy. Syria changed the world. It brought the Russians and Chinese (BRICS) into the fray and changed the global order from a unipolar one to a multilateral one - overnight. And it created common cause between a group of key states in the region that now form the backbone of a rising ‘Security Arc’ from the Levant to the Persian Gulf. We now have immense opportunities to re-craft the world and the Middle East in our own vision. New borders? We will draw them from inside the region. Terrorists? We will defeat them ourselves. NGOs? We will create our own, with our own nationals and our own agendas. Pipelines? We will decide where they are laid. But let's start building those new narratives before the 'Other' comes in to fill the void. A word of caution. The worst thing we can do is to waste our time rejecting foreign narratives. That just makes us the 'rejectionists' in their game. And it gives their game life. What we need to do is create our own game - a rich vocabulary of homegrown narratives - one that defines ourselves, our history and aspirations, based on our own political, economic and social realities. Let the 'Other' reject our version, let them become the 'rejectionists' in our game… and give it life. Pata Pata! It's party time at Pundita blog! Ont-ils la peine de mort en France? "Surrender now, you have nowhere to go"
Angela Merkel: You call this bilgewater beer?